Sagarika has put in her heart and soul into an excellent book that I strongly commend to every Indian. The book is an engaging attempt to educate a country that has understood liberty only imperfectly through sporadic literary flourishes but has never really grown out of its feudal mai-baap mindset towards government. Gurcharan Das’s India Unbound was perhaps the first popular book to promote liberty but in many ways Sagarika’s book is more urgent. Sagarika doesn’t pull punches. All political parties get their dues. Some people on social media seem to think that Sagarika supports Congress. I couldn’t find any such evidence or any single-minded opposition to BJP. People should read the book before passing judgement on Sagarika’s political preferences. The book starts with enormous clarity of thought. “The argument of this essay is in favour of social and economic liberalism in the belief that the two cannot be segregated”, she says. This is correct. Freedom is indivisible. We can’t be free in thought without being free in action – in all our actions. The only restriction to action that is acceptable is when someone physically harms another. Sagarika is widely read. I am almost jealous that she has met and interviewed Isaiah Berlin. (I assume she must have read his Four Essays on Liberty although these are not specifically referenced.) She has also studied Rajaji and Masani and believes that Gandhi is the best example of a liberal leader that India can offer. “For the purpose of this essay I have chosen to emphasize the Gandhian definition of the term ‘liberal’. Mohandas Karamchand Gandhi was, in many ways, the most successful liberal politician of all time”. This view is largely correct and I recognised this in my 2008 book, Breaking Free of Nehru, when I contrasted Gandhi’s small government ideas with Nehru’s grandiose ambitions for the state. But after scouring Gandhi’s complete works (a million words, now digitally available) I’ve become increasingly clear that Gandhi’s economic ideas were wrong. He tried to invent a “new” economics in ignorance of the marginal revolution or even Kautilya’s Arthashastra. And he badly misrepresented Adam Smith without reading him. He wrote: “What Adam Smith has described as pure economic activity based merely on the calculations of profit and loss is a selfish attitude and it is an obstacle to the development of khadi …the tactics … adopted in a profiteering business have no place in khadi activity. For instance, cheating, fraud, falsehood, adulteration, exploiting people’s addictions or their baser feelings things practised in mill industries and ordinary trade—are to be completely shunned in khadi activity.” This is almost a Marxian diatribe but its origin lies in Gandhi’s ignorance of economics, even though many of his intuitions about individuals were right. The best and most passionate sections of Sagarika’s book relate to freedom of expression and social liberty. And she has superb sections on the liberation of farmers and women. In these matters her position regarding reforms is almost entirely consistent with our party’s declared positions. The liberal concept has, however, evolved significantly over the past fifty years into ever more market-friendly directions. When I met her for the first time in October 2018, I suggested that she explore economics in some detail. My book on economics for children from age 10 to 100, Seeing the Invisible, could provide a helpful introduction. I’ve particularly recommended James Tooley’s The Beautiful Tree – a book that develops Gandhi’s insights about school education and opens one’s mind to the brilliant world of accountability that the private sector has built. In this process of future study, I hope Sagarika can accept our party’s position that the government should not only get out of managing education and health but even things like water and roads (wherever that is possible). On her own volition, Sagarika has recognised the gurukul system and asked in the book: “the liberal must also raise the question: isn’t first nationalizing education and then expecting that the autonomy of those nationalized (or government-controlled) educational institutions will be respected a bit of a pipe dream?” The answer to this question will show her (and India, through her) the way forward if we want to educate our crores of ill-educated youth. There is one particularly valuable contribution Sagarika has made – through her research on the Indian origins of liberalism. I’ve been trying to jointly write a paper on this topic along with fellow liberal Sanjay Sonawani. Sagarika’s book will add significant value to our research. There is one difference with her approach to women that I must note. She believes that “allowing … women into Sabarimala by the Supreme Court is an important reaffirmation of Hinduism’s inherent spiritual democracy”. Our party believes that it is not the job of a court to reaffirm any spiritual matter. The government and courts must stay strictly out of all religious matters unless physical harm is involved. The book’s sub-title claims it is “A Manifesto for Indians Who Believe in Individual Freedom”. Perhaps I have a different notion about this and consider that a manifesto should involve a structured set of ideas for reform. I have been a liberal manifesto writer for over twenty years now. I began in February 1998 when I determined to build a liberal political party for India. This led to the 1999 People’s Manifesto, in consultation with around 500 people (this document is available on the India Policy Institute’s website). In 2008 I wrote Breaking Free of Nehru which provided a clear action plan for India. In 2013 I used all this knowledge as well as Sharad Joshi’s work to write the Sone Ki Chidiya reform agenda. All this work then fed into the Swarna Bharat Party’s manifesto. I suggest that the book is a great essay but is probably not a manifesto. Or maybe it is a different type of manifesto. I have another comment to make. The book educates and exhorts but stops short of proposing a vehicle to take this forward. In 2004 I wrote that a liberal is one who politically fights all his life for liberty. No great liberal merely wrote books. Therefore, exhorting corrupt socialist parties to adopt liberalism is not the way out. And it is not as if people haven’t tried to guide them. I personally explained these matters and handed over the Sone Ki Chidiya agenda in July 2014 at Delhi’s Ashoka Hotel to Jitendra Singh, Minister of State for Prime Minister’s Office. I also corresponded and spoke with Vinay Sahasrabuddhe who held the pen on BJP’s 2014 manifesto. But the BJP is not interested in reforms. It is a political beast for self-aggrandisement of its leaders, with absolutely no concern for the people. The same goes with Arvind Kejriwal whom I met in 2012, with similar results. The socialists will not change their spots. India wont’s become free unless a national liberal party comes to power. It is time for action. I hope Sagarika will join politics and directly take India forward in the direction she has outlined. Sharing for the Delhi liberals who may follow this blog. Although I’ve not yet read Sagarika’s book (which I’ll get to read when I reach Delhi in end-January), I think Sagarika has a broadly liberal inclinations including for economic liberty. I will comment further when I read the book and review it. 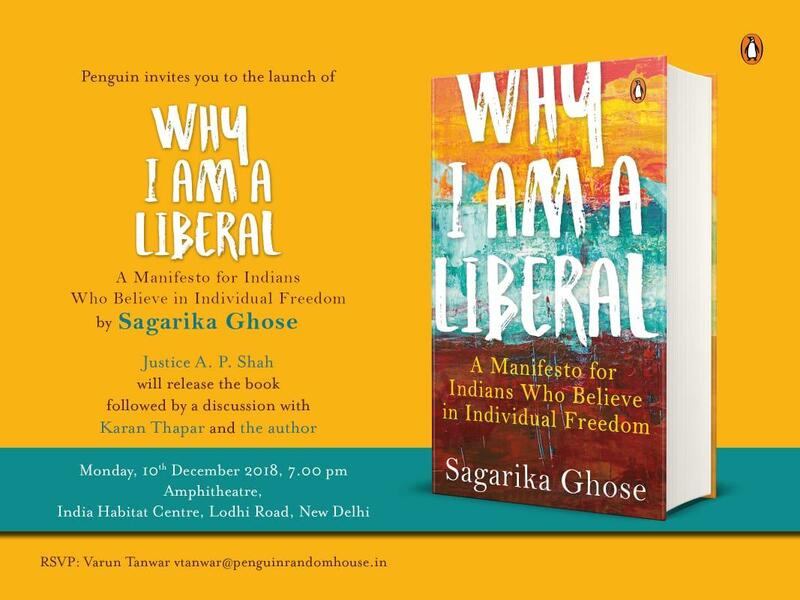 In the meantime, if you are a liberal are are in Delhi on 10 December, please attend this event (and do buy and read the book – that’s crucial to truly understand Sagarika’s views) and let me know what you think. I’m always interested in analyses of the Arthashastra. Reporting this here for my future reference. The thesis confirms my readings so far from a variety of sources. The ancient Indian state can be best characterised as a pre-liberal capitalist state. The moot question relates to the level of freedom of thought and speech. It appears that there was significant freedom of thought and religion, but there was somewhat limited freedom of speech. The responsibility of the raja in the Vedic sources was primarily that of a leader in battle and the protector of the settlements. it is also important to note the Aitareya Brahmana literature, which stated that, “state and kingship had emerged from military necessity.”25 In exchange for the protection of people, the king received obedience and their contribution to the maintenance of his reign. After taking into full consideration the person and the offence, the motive, seriousness or lightness (of the offence), the consequences, the present (effects), and the place and time, the magistrate shall fix the highest, the lowest and the middle in the matter of punishment remaining neutral between the King and the subjects. “Local circuits of trade linked the villages, gramas, with the local market centres, nigamas, and these in turn with the towns, nagaras, the commodities in circulation being largely items of basic consumption.“39 Trade was certainly not limited by India’s natural waterways; in fact, trade flourished along the Ganges and river traffic “provided a wider circuit of exchange.”” While some scholars doubt the extent of trade with neighboring empires, it must be pointed out that, well before the Vedic age, archaeological evidence of clay seals throughout the Indus Valley and the ancient states of Mesopotamia like Ur, Lagash, and others suggests a strong trading environment between the inhabitants of theIndus Valley, specifically Mohenjodaro/Harappa and the Ancient Mesopotamia. “…the Administrator should cause to be entered in the Register the number of villages, classifying them as best, middling and lowest…grains, cattle, cash, forest produce, labour and produce in place of tax.”7 Kautilya further detailed what was taxable from the countryside so that his superintendents knew exactly what constituted revenue for the state. He told them, “the aggregate tax, the one-sixth share, provisions for the army, tribute, tax, the ‘lap’, the `side’, compensation for loss, presents, and income from stores constitute revenue from the countryside.”8 The “one-sixth share” in the sentence above refers to bhaga, which is to be understood as a share of produce from private lands, usually one-sixth. The one-sixth share is not fixed, as the tax fluctuated depending on the condition of the countryside. In fact, it went as high as one-fourth or one-third from the most fertile land, “according to yield” on an average land. Not much was expected from un-arable land which, as Kautilya stated, was better suited for infrastructure. work by sending his own female slaves to them with (a view to) support them. for an extremely structured welfare state. Kautilya gave due attention to the physical attributes of cities and towns. In other words, the dwellings in cities and towns had to not only adhere to certain criteria for maximum benefit of the people but at the very least had to provide resources within their reach.